For residents of Salem, Massachusetts, the day after Halloween brings empty candy wrappers, sagging pumpkins, and a community-wide identity crisis. That is, until Lee Barrett’s TV production class suggests extending the spooky season with the traditional Mexican celebration Dia de Los Muertos. But when the students discover not all of Salem’s dead are resting in peace, the post-October blues don’t seem so bad after all . . .
As if a series of haunting graveyard visits isn’t disturbing enough, Lee and her policeman boyfriend connect the crime to an unsolved missing person case. Driven by a series of chilling psychic visions, Lee calls on her cleverest allies—including her shrewd cat, O’Ryan—to go underground and dig up the evidence needed to put a lid on a cold case forever . . . before the latest headstone in town has her name on it! Salem sounds like quite the happening place! I’ll have to check this series out–thanks! I love Salem. I’m going to need to check this series out. I love this series. I haven’t read this one yet but it sounds great! Great series. 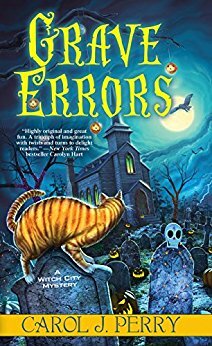 Really looking forward to reading “Grave Errors”. Salem witches and cats! Perfect! What a great book for Halloween! I have added it to my tbr list. Thanks for sharing. I love that her kitty helps her solve the case. What a fun series! Wishing you continued success with your latest installment.